SHIPPING SPECIAL, around $119 shipping, curb side delivery,to most locations in the continental USA! The Expanded Queen mattress is an obsolete mattress size, 66" wide by 80" long. The normal Queen size mattress is only 60" wide and 80" long. So, obviously, the length is the same but the Expanded Queen dimensions are six inches wider. Six inches may not seem like a lot to you, but Expanded Queen sleepers will tell you, size matters when it comes to mattresses, even six inches. The extra width is GREAT! Please note that the foundation for this bed is an actual queen size. This means that the mattress will overlap the foundation on either side about 3". While this is not an ideal situation, it does still really work. You get a larger than Queen bed size and still get to use your Queen headboard and bed frame. Up until now, if you owned the rare and mostly obsolete Expanded Queen mattress, getting a replacement was either impossible or a very expensive special order ordeal. Use the check box menu to add the bunkie board topper for in between the mattress and box foundation for an extra $99. Most people already have this and may not need to replace it. The bunkie board topper adds support along the edge of the mattress. 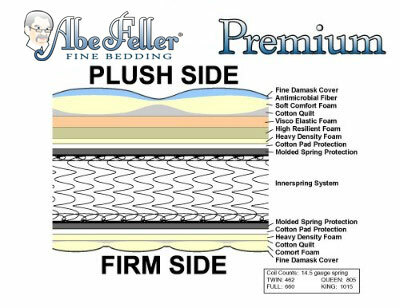 ABE FELLER® To The Rescue! We have decided to bring back the Olympic Queen Size and call it the Expanded Queen Size Mattress! Please note that we sell Olympic Queen or Expanded Queen (same Size) sheets, comforters, mattress pads, metal frames and feather pillow toppers. Coil count is approximately 805 Coils. 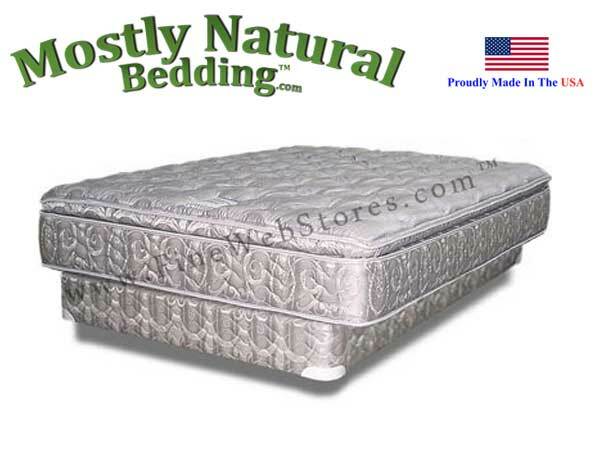 This Expanded Queen Mattress has one plush/pillowtop side, and another firm, non-pillowtop surface on the reverse side.